Powerful, versatile PA system featuring Yamaha CBR Series speakers. These premium Phonic PA packages make it easy to get started quickly with everything you need to hit the stage. We’ve done all the work for you and hand-selected the components for optimum performance. Each package delivers your choice of a pair of pro-grade Yamaha CBR Series 10 in, 12 in. or 15 in. passive speakers, a Phonic Powerpod Series mixer, a pair of speaker stands and a pair of speaker cables. Rounding out the packages are dynamic handheld microphones, boom mic stands and mic cables. 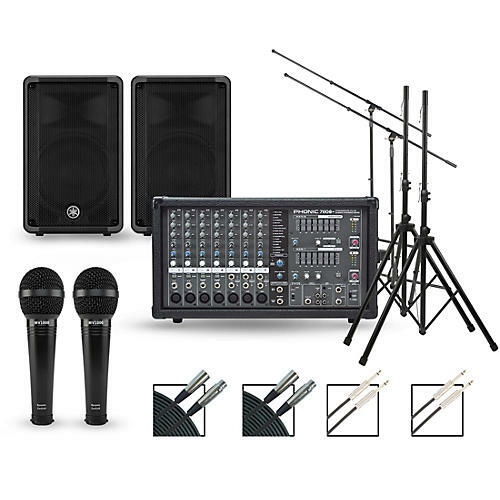 No matter your choice, each package is loaded with high-end technology and components for a powerful live performance. Drawing on decades of experience designing pro-grade speakers, Yamaha built the CBR Series to deliver uncompromising sound quality and portability in a versatile enclosure. Whether you choose the 10 in., 12 in. or 15 in. model, you can count on plenty of power handling and clear, unwavering sound. Rugged molded cabinets, custom-designed transducers and wide dispersion make the CBR Series suitable for a variety of applications. Order today and get stage-ready in a snap.